Bring on the muscles! 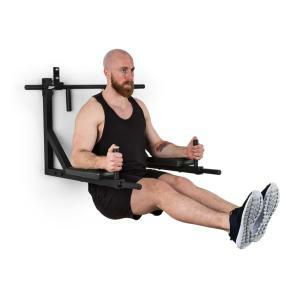 Well-trained arms, shoulders, abdominal and back muscles in the space-saving home studio - with the Klarfit Bouncer multifunctional training station, no problem. The robust training device made of powder-coated steel is simply hung on the wall with the included wall hooks. Thanks to the reverse option, it can be used either as a pull-up or as a dip and leg raise station. With a load of up to 200 kg, the pole is suitable for practically all athletes. 8 handle positions provide a wide variety of possible exercises, in the smallest space. In addition, a firm, secure grip on the unit is ensured by the rubber sheathing on the 12 x 3 cm (LxØ) handles. 4 cm thick cushions on the armrests and on the back guarantee a pleasant workout on the MultiGym. The Klarfit Bouncer dip station allows for even more training variety with the possibility of using it on the ground for dips - especially good for weight training beginners - or for doing push ups. If that's still not enough, use the large attachment lug to extend the power station with additional equipment, such as sling trainers or power ropes. Always one training session ahead: with the space-saving Klarfit Bouncer multifunction pull-up station, you can always train your back, stomach, arms and even legs in the home fitness studio. Fab Multigym. I have mounted it outside and its simply great. Would recommend.